(or ecogeomorphology) is the study of the two way interplay between organisms and geomorphology. Geomorphologists are primarily interested in the evolution and erosion of landforms across the globe including iconic geodiversity features such as coral reefs and sea stacks. Biogeomorphologists study how organisms shape the landscape and landforms and how their activity is mediated by other geomorphological processes. Construct new landforms and are called bioconstructors. Corals, mangrove forests and beaver dams are good examples. Erode landforms and are called bioeroders. Sea urchins and badgers are good examples. 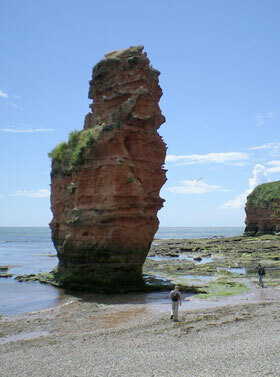 Protect landforms from other agents of deterioration and erosion, such as waves and salts. 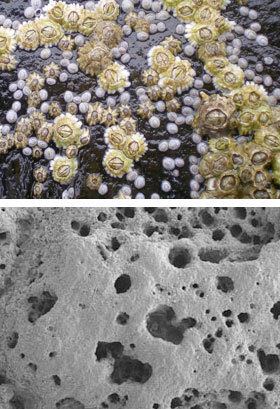 These are called bioprotectors and ivy and barnacles are good examples. Some species are mainly protective but sometimes cause deterioration (e.g. ivy) and the relationships between organisms and geomorphology are often complex. is also called ecosystem engineering as plants, animals and microorganisms are directly or indirectly involved in sculpting the physical habitat of other organisms. For example, tiny, microscopic organisms (microns) have been found to drill into rock surfaces making them retain water for longer and increasing surface roughness. This then provides a wetter, rougher surface which makes it easier for animals such as barnacles to colonise and survive in the intertidal zone. In each environment, there are links to current or recently completed research projects, which provide detailed examples of biogeomorphology research. If you have a biogeomorphology research project that you’d like to have linked to the site, please get in touch. to get interested and engaged in biogeomorphology research – so if you happen to SEE something that looks like a biogeomorphological process in action please take a photo and email or tweet us!